Experience expedition style cruising aboard Coral Discoverer and don’t miss out on a viewing of Staircase to the Moon in Broome! Exclusive to Holidays of Australia & the World. Experience an immersive expedition cruise aboard the Coral Discoverer, getting into all of those intimate nooks of the Kimberley’s. Ride a camel along Broome’s golden beaches at sunset. The perfect time for viewing Staircase to the Moon. 1 night stay in Darwin at Hilton Darwin including breakfast. 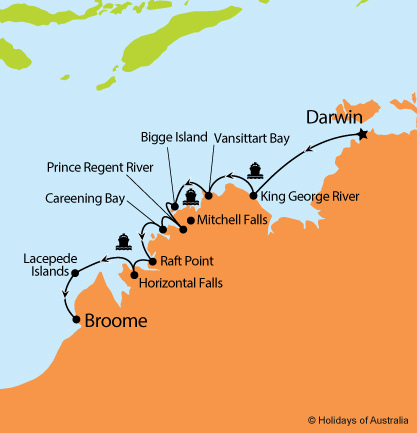 10 nights aboard the Coral Discoverer from Darwin to Broome. Your cruise includes onboard meals and sightseeing. 2 night stay in Broome at Oaks Cable Beach (or similar). Sensational Sunset tour Camel Ride. Full day Willie Creek Pearl Farm tour. Viewing of the Staircase to the Moon.